NEWS about World War 3. Are we on the road to World War 3? How much time do we have? Is there anything we can do about the events which are soon to overtake those living on the earth? NOTE: We’ve updated the format of WW3Watch. All of the updated sections are upfront. Those sections which are still important–but do not change as much–are offered at the end. We’ve substituted links for some of the “older” (but still important) parts of WW3Watch. This has been done to streamline WW3Watch. Anyone who wishes to read these parts in their entirety, may consult World War 3 Watch: May 30, 2016 (or an earlier issue) or follow the links provided. November 21 – The media dialed it WAAAAAY back on the World-War-3-o-Meter this past week. There was much less talk about World War 3 this past week. Still, what talk there was decidedly more than the amount of talk at any other time over the past 3-4 years. Once again: the amount of chatter and speculation on WWIII (there was very little live action war outside of Iraq and Syria and a few other Middle Eastern spots) took a step back. Most of the media noise concerned concern over Donald Trump starting a nuclear war somehow. Russia and the USA, as has been usual over the last several months, dominated the World War III talk. It seems a good time to remind folks that despite all of the theatrics, Russia and the USA are really on the same end times team. This will become apparent after the next war. According to media reports, the world seems to have settled into a period of perpetual uneasiness and anxiety. Somewhere close to 720 articles have been linked to at WW3Watch since the beginning of summer. That’s a LOT of World War 3 media attention and it dwarfs the amount of such talk in 2013-2015. There are 20 links in this week’s UPDATES section. Unlike the past several weeks, there was not a huge backlog of WW3 pieces we skipped over. If pressed, it is likely we could have added another 10 pieces but that is the limit. Over the past 2-4 weeks, we easily could have listed 50-60 WW3 links. IS the world NOW on the edge of World War? It seems likely it’s not very far away, perhaps only months. HOWEVER, when World War 3 DOES break out, there will be NO warnings in the news media. It will be sudden and swift. The media will do its usual job of building fear, hatred and anger and then probably go “dark” for awhile. It’s suspected that war will begin during one of those dormant, “dark” periods. During those lulls is when it is suspected the shooting will eventually start. This will allow for the maximum unease and anxiety (and eventually chaos) among the masses. So again, don’t look for any advance warning in the media for World War 3. A new consideration was raised a little over a month ago and it was interesting, so it’s being included once again. Perhaps the heightened WWIII talk in the Corporate Media is only propaganda (which depends on a heavy dose of repetition). After all, the US and Russia kept up the Cold War for 45 years. Perhaps the idea is to create FEAR (a product regularly peddled by the Corporate Media). Perhaps World War 3 will be largely fought in CGI. There WOULD be some chaos and bombing on the US home front–to create an even greater atmosphere of fear. 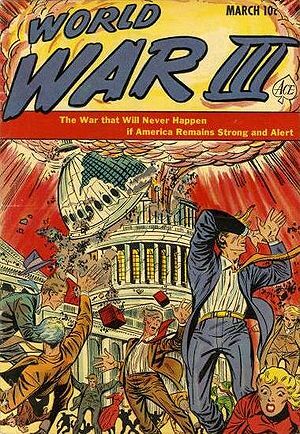 But most of the “war” would be fought and presented as the “news” is today: in a false reality created by those who control the media/entertainment/government. The false reality which has been created–and which the vast majority mistake for actual reality–has been created for some reason. A simulated World War 3 involving Russia and the USA and China and others would be a great “dress rehearsal” before the lights come on at the climax of human history. To drive the world into the one-world beast system which is not too far away. This week’s World War III news–like the past few months–was mostly about Russia and the USA and nuclear war in general. SYRIA has quieted down–even though Russia resumed bombing Aleppo this past week. NORTH KOREA was back in the news by, as it usually does, threatening the USA. There was still some residual Nostradamus article, but nothing new was offered so they have not been included this week. Anyone wanting access to those types of links can see last week’s issue of WW3Watch. There continued to be plenty of speculation about President Trump causing a nuclear war. There was a tongue-in-cheek article about preparing for nuclear war. Can anyone prepare for what’s coming? NOT if one believes the Bible, which specifically tells of men going underground into bunkers in an effort to escape the wrath of God. Unlike Nostradamus, the Bible is crystal clear about what will happen in the end times–particularly to those who take refuge underground (as in underground bunkers). NOT that it does them any good. Underground Bunkers in the End Times: Will they Work? Underground Bunkers for the End Times: What does the Bible Say? Will the next major terror attack hold off until after the 2016 US election? It looks like it (the very well-publicized threats in the Corporate Media notwithstanding): it’s a week after the election and no terror attack has materialized in the USA yet. How long will this uneasy quiet which has gripped the world last? Will the anti-Trump protests trigger a greater period of civil unrest? When will the next 1-rash of terror attacks hit the USA? But a lot of that was based on the constant hype in the media which, so far, has turned out to be the usual blah-blah-blah. HOWEVER, one guess is as good as another–unless the guesser labors for the mystery of iniquity. Even then, many are deceived about the true schedule of man-manufactured events. The USA’s civil unrest, so prominent during the spring and early summer, went into hiatus later in the summer but resumed a few months ago with claimed killings in Charlotte, Columbus OH and Tulsa and police clashes during protests in Charlotte. Chaos is still spreading around the world. Even those areas which are still relatively peaceful appear to be uneasy and the local media in many areas continues to warn and promote a fear of chaos and terror. The media continues to churn out pieces providing reasons the USA’s traditional allies won’t come to the assistance of America in the event of all-out war. This includes the NATO countries and the Philippines. Time is growing shorter. Every day is another day closer to World War 3. To repeat what we’ve said all during the first half of 2016: It looks like the Summer of ’16 (and the entire second half of 2016) promises thrills, chills and spills! The Summer of 2016 started out with a bang but has tapered off somewhat over the past couple of months. The second half of 2016 has, so far, NOT DISAPPOINTED on the excitement front. Will it continue? OR will it fade? World War 3 is a day closer today than it was yesterday. No one on earth knows when the fighting will begin. But the stage has been set for some time. World War 3 Update: Russia and China to unite against the USA? Putin, Trump or Europe: Who will be responsible for World War III? Who could stop nuclear war in the Trump era? These scientists. Trump has his finger on the nuclear trigger. What will he choose to do? WOULD YOU SURVIVE A NUCLEAR BOMB? Below are a few sites which calculate the effects of nuclear bombs dropped on the USA. The reader can choose location, size of nuke, how many bombs are detonated and other variables. Little has changed from last week. The TONE of the WW3 coverage has softened this past week. Also the number of voices shouting “World War” has lessened over the past week. July and August are now finished; September and October are over as well: there’s a 50% chance of World War III; which is +1% change from last week. Not because the world war situation is any worse (it’s not) or better (it’s not). Tensions ARE running high–at least in the media–and there are reasons for that. The +1% uptick is more about the amount of public threats Russia and the USA continue to make–though it must be pointed out that the USA and the Soviet Union (Russia) threatened each other for 45 years during the Cold War. Uneasiness among the world’s peoples is now the new normal. Because there’s a feeling there’s yet some pieces to move into place first, the verdict here is: There’s STILL a little time left yet. Less than there was last week. At least until the shooting starts. When World War III begins, there will be NO WARNING in the papers or other media. The “chance of World War 3” number has more to do with the time drawing closer than it does with any specific event. It also has to do with the increased war chatter in the media. Propaganda depends on repetition. Of course, the constant drone of WWIII news presently could be total deception and the usual fearmongering. June and July have come and gone. August, September and October are gone as well. We’re still keeping an eye on the second half of 2016, particularly on late September-early October. The USA’s national political conventions always seemed like a time for unrest to break out and spread, both before and after. But they have come and gone with few disturbances despite weeks of the Corporate Media fear campaign. Early October assessment: Though the world is not at war, there seems to be a tension in the air. One situation which promises a US war with Russia and China is the desertion of the USA by its traditional allies around the world. This past week it was the Philippines. Mid October assessment: There are increased threats daily. Any “October Surprise” has SO FAR not involved any shooting. Will something involving the US elections take place? The Corporate Media has been strongly hinting at such an occurrence. Late, Late October assessment: Russian president, Vladimir Putin, injected himself into the US elections by warning the USA that Hillary Clinton’s Syria policy, should she be elected president, could lead to severe consequences (translation: World War 3). This is pretty much unprecedented by a foreign leader BUT these are times in which previously “unprecedented actions” will occur. Mid November assessment: Syria and Iraq continue to be hot spots, especially Aleppo and Mosul. But the rest of the world appeared to quiet down after the US election. Will the quiet continue? HOWEVER: All this is the beginning, not the end. We appear to be in the “wars and rumours of wars” and the “wars and commotions” stage of events. The real action is still in the future. But the future is getting closer. 50 percent is about average historically. However, this a +20 since the Paris attacks in November 2015. Continued action in Syria or the Middle East could raise that number quickly. The number of public threats exchanged between Russian and American proxies in early/mid-October has raised the assessment percentage 5 percent over the past several weeks. However, those who believe “all war is an engineered event” are convinced that this means big things are just over the horizon. HOWEVER, there is still a feeling here that events have a little bit longer to go before WWIII begins. The long term view is 100%. This is no change from our last edition. Pre-war propaganda levels in the USA against all things Muslim continues to escalate. The escalation in anti-Muslim propaganda in the USA began about in August 2014 and continues full force at present. Pre-war propaganda usually starts somewhere between 18 months to three years before the shooting starts. The USA has been in pre-war propaganda mode for over two years (August 2014). NOTE: Something readers should keep in mind: the USA and Russia kept tensions high for 45 years during the Cold War without ONCE facing off in a shooting war. The tensions were continued by proxy wars in Korea and Vietnam and dozens of other, lesser points around the world during that 45 years. Of course, when World War 3 DOES begin, it’s likely to happen quite suddenly after a long build-up. The world is in the building-up stage at present. But then again, as a point of comparison, the world built up for 45 years during the Cold War. The Corporate Media continues to hype fear in the homeland. This has been our mantra for the past year. Will it play out? OR will events prove that the world is heading into a period of peace, love and brotherhood? Will a major terror attack happen before Barack Obama leaves office (as the consensus here has been for several years) OR will that happen on the watch of the next president (whoever that might be)? There’s no reason to expect a domestic terror attack won’t happen. Expect this number to gradually increase until the actual attack takes place. Every day which passes by until January 20, 2017 brings the next attack a day closer. Is the deceptive media setting up another scenario of hyped tensions over a long period? Little has changed from last week. However, the Bible is clear that at some point, there will be World War. That is our final arbiter. Nine weeks ago the USA suffered a number of smaller attacks which some called “terrorism” (Islamic State claimed responsibility for one of the attacks). Was this the beginning of a wave of attacks leading to the USA to go to war after the new president takes office? The above is what we’ve been writing for the past couple of months. The civil unrest started the night of the 2016 election–supposedly by the anti-Trump forces. The rioting in various US cities ran about four-five nights. Will the unrest over Trump start again? Will it contribute to WW3? Still looking for a terror attack prior to January 20, 2017. June 2016 has come and gone and so has July. August, September and October are completed. All of the comparisons of the Iran-USA nuclear deal last summer with Munich appear to have been overblown. September/October 2016 has also drawn our attention for reasons previously explained. While World War 3 did not start in September or October 2016, the amount of war talk sharply escalated in the media during those two months. But nothing more than media chatter at this point has occurred. It doesn’t get any better from here on out (Though the man of sin has a short period of “peace and safety” before the wheels come off his wagon). Time continues to tick away to the end of Obama’s term. And the feeling is very solid on something big happening before he exits office on Jan 20, 2017. There are 81 days until Inauguration Day 2017. That’s less than 3 months away. The world is on a steady march to World War 3. There will be periods of calm, periods of violence. Even during the periods of quiet, nothing will deter the beginning of World War 3. Overall Tension Assessment:The assessments have remained largely unchanged over the last twenty-five months. The assessment continues to be QUIET with a continuing chance of terror leading to war. 2016 has always looked like a logical time for events to begin OR it could happen AFTER the first of the year. ONE POINT we want to make. And we make this point knowing that many who read this do not place any faith in the Bible. BUT, no matter how men may plan and scheme and conspire, the timing for World War 3 is NOT in the hands of scheming men: it is in the hands of God and will NOT begin until the Red Horse is set loose. Regardless of what men may have planned. Actually, if it were up to men, WWIII would likely have already begun by now. No one appears to be in a hurry to commence World War III. Of course, a major event will suddenly change all of this. Will this coming week bring bad news? From World War 3 Watch: July 11, 2016 – For more info on civil unrest in the USA, see Long, Hot Summer. From (5-30-2016) – Revelation 6:4 and Damascus, Syria (Isaiah 17:1). From May 30, 2016 – So how does the world seem to know that World War 3 is just ahead? From (4-11-2016) – INFO on Threats of domestic terrorist attacks. From (2-22-2016) – Three new trends WW3Watchers surely noticed. From July 2015 – What we said in July 2015 and what others said as well – Countdown to Munich? From World War 3 Watch: June 1, 2015 – Next domestic terror attack. NOTE: IF new readers want the regular, longer version of WW3 Watch, they can consult [World War 3 Watch: January 25, 2015] and earlier issues. Most of the basic assessments have not changed significantly in the last 8-10 months or so. Is this the start of World War 3? The feeling is that the Middle Eastern war which begins WWIII won’t start until the USA suffers an attack of ‘terror’ much worse than what hit Paris. Who knows when the terror attack on U.S. soil will happen? Who knows what will happen in 2016? We’re still holding to our original idea that a terror attack on the USA could happen any time before the 2016 presidential election, BUT seems more likely in September-October 2016. All this DOESN’T MEAN that World War 3 won’t happen: it will. Events are getting more serious. SPECULATION: World War 3 will start in the Middle East and spread to Asia to include the Koreas, Taiwan and China. And probably other countries as well. Until that all gets underway, expect a period of calm over the upcoming months punctuated by outbreaks of violence designed to keep the folks at home guessing. HOWEVER, history records it is during the midst of relative calm that previous World Wars have broken out after long periods of underlying tensions and military build-ups. TICK TICK: Iran deal = Munich comparisons time clock runs out the beginning of July 2016. REMEMBER: World War 3 will happen. It’s not a matter of IF, it’s a matter of WHEN. World War 3 will happen. The Bible [Revelation 6:4 among others] is clear on the subject of an end times world war. Though evil men may scheme and plan in secret; though YEARS may be spent carefully honing the strategy; though World War III has been a long-term project: EVERYTHING is on God’s timetable, not man’s. When it is time, the red horse of Revelation 6:4 will be released. World War 3 is coming–and it is a certainty. For many WW3 watchers, the periods of calm are more uneasy than the periods of turmoil. And the world has been going through a relative period of calm over the last few month. Every day brings WWIII closer to reality. That point could well be in the next twelve-sixteen months. Fear in America – Who will You Believe: the Media or the Word of God? What will this coming week bring? The main reason is: we do not have any special source of information not available to others. But in case its forgotten, the following (from a year-and-a-half ago) was just discovered and will serve as a reminder. Looks like we were about a couple years early on that assessment. [For info from earlier editions of World War 3 Watch, consult one of the older issues. Last Days: What does the Bible say about the End Times? World War III on the horizon? © Jeremiah J. Jameson and End Times Prophecy Report, 2012-13. © Mondo Frazier, DBKP and End Times Prophecy Report, 2007-13. Unauthorized use and/or duplication of this material without express and written permission from this blog’s author and/or owner is strictly prohibited. Excerpts and links may be used, provided that full and clear credit is given to Jeremiah J. Jameson and End Times Prophecy Report with appropriate and specific direction to the original content. ‘Munich’ comparison to Iran deal: silly or appropriate? WW3 Alert: Putin Tries To Poison Hillary Clinton? America Out For Revenge?